Install professional telephone systems for your business that offer flexible and reliable ways to communicate over broadband. Sophisticated and cost saving. 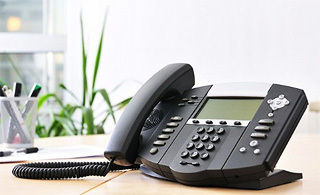 VoIP (or Voice over Internet Protocol to give it its full name) is technology allowing you to make and receive telephone calls over your broadband connection. You may hear it referred to as IP telephony or broadband phone, either way VoIP provides one of the most flexible and inexpensive ways to communicate by telephone and is available right now. VoIP is perfect for businesses and organisations who are looking for a professional telephone system at low cost. Compared with a standard telephone system, VoIP offers significant savings on both calls and line rental – calls are charged per second, NOT per minute as with BT and other providers. If you are making high levels of short calls this could represent a significant saving over the year. In addition your system can grow with you. Need more lines? No problem! Need more handsets and extensions? Just add them on as required. VoIP is perfect for homeworkers and people working away from the office as it simply “plugs in” to your system offering seamless connectivity wherever you are. Another great advantage with VoIP is the ability to have a “number for life” even if you move outside of your area.